The tigers eye stone is magnificent. The stripes appear to move in it. The setting is intricate but large bold and masculine.Consider that the space under the stone makes for a roomier fit. This handmade creation is offered in partnership with NOVICA, in association with National Geographic. 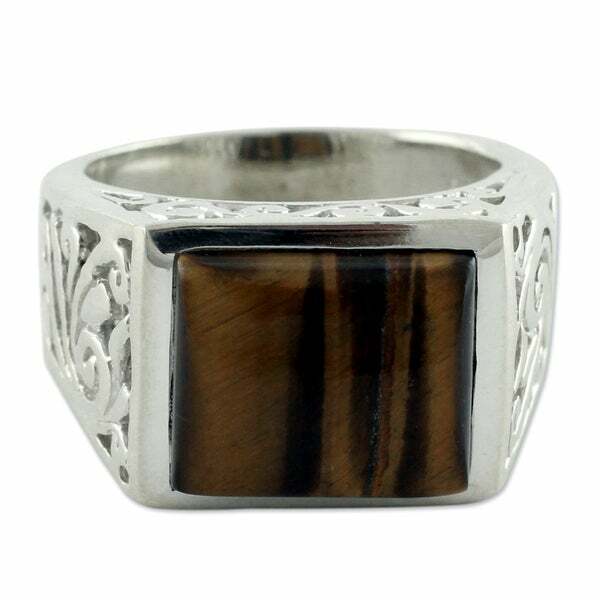 Sterling tendrils flank polished tiger's eye in a distinguished ring for men. From Alok Jain, this design is meticulously crafted by hand of sterling silver. My journey into handicrafts has been great, yet the highlight came in 1995, when the Sultan of Brunei placed an order for my designs! Hello, my name is Alok Jain and I was born on December 12, 1971. My family has been involved in the realm of handmade for many years now. I was barely 17 years old when I realized I was completely immersed in the creation of handmade pieces, including sandalwood and brass items and jewelry, among others. Lately, I have been much more involved in the design of jewelry. I'm inspired by nature hence you will find that most of my jewelry items feature natural motifs. My journey into handicrafts has been great, yet the highlight came in 1995, when the Sultan of Brunei placed an order for my designs! It was time bound, it took me and my artisan collaborators about two months to complete the order. All in all, it was a really exciting experience to be working all together.I always strive to improve designs and quality, and demand for my products has steadily increased. I hope and wish that my association with Novica will bring opportunities. Dimensions 0.7 In. X 0.6 In. X 0.4 In. I asked my husband to pick out a ring for his birthday. After an extensive search he selected this tiger's eye ring. The gemstone is nicely polished and the silver work is beautifully done. He even reported to me that he's received a number of compliments from co-workers and friends. The band is rather thick so if you're in between sizes definitely size up. Great purchase! Very nice ring. My boyfriend enjoyed the square design. The stone was nicely colored and polished. The silver design on the sides is very nice too. I am currently wearing this ring,as I am typing this review! I love it,quality craftsmanship,fair price and excellent service in every aspect! A+++++ I highly recommend to any "Tiger Eye" gemstone lover! The stone in the ring quite pretty, however the design in the band is a bit dangerous. It catches on clothing, & other items. May if the design were smaller it wouldn't catch on so many different things. Have had this ring for 3 months now and I wear it daily, absolutely Love the design and quality!! Highly recommended! I got this for my hus bands birthday. He loves it. Fits perfect and the stone has lists of color. Impressive ring. Really shows off the tiger's eye. Beautiful piece of jewelry - purchased for my grandson. This ring is just okay. Not a favorite but I also don’t hate it. The stone is very nice I wish the sides were more solid and masculine but I do like the ring it’s just not my favorite. The ring is very nice quality and fits perfectly. I get lots of complements on it. Beautiful ring. Understated elegance yet boldly masculine. Great man's ring? "What size would I need if I wear 9 in women's I'm trying to get it for my Fathers little finger. ."
"Hi, I am interested in buying the product, after using your ring sizing I feel I am an 8.5 - is it possible to get the band made for this size as it isn't an option? Thanks"
Have you used the "ring sizer"? always go to the next size if it is at all tight. The Ringsizing.pdf is GREAT to use. "Hi, I am not sure on my ring size; can you confirm how many inches circumference around the finger each ring size you offer is please? Then I can measure and select the best fit. Kind Regards, Marlon"
Hello, please see the following link to download our ring sizing guide (http://www.overstock.com/downloads/pdf/2010_RingSizing.pdf). Ring sizes are not in inches. Use a ring "sizer" and it will help you determine the size. I purchased this ring a few months ago and bought a 10, though for many years I had a 9 ring size. The ring has fit beautifully. Looked Great & reminded me of my fathers ring!! "Can I get one in size 11.5 for *****?" Hello dcc292, the size 11.5 is currently unavailable, our inventory is changing everyday. THanks for shopping with us!